Which of the following is not a presenting feature of oral cancer? 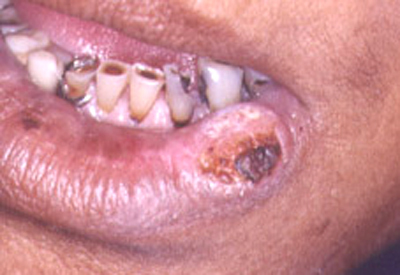 Early lesions appear as leukoplakia or erythroplakia; more advanced lesions will be larger, with invasion into tongue such that a mass lesion is palpable. Ulceration may be present. Squamous cell carcinoma accounts for 90% of oral cancer. Aphthous ulcers are found on freely moving, nonkeratinized mucosa (eg, buccal and labial mucosa and not attached gingiva or palate), they may be single or multiple, are usually recurrent, and appear as painful small round ulcerations with yellow-gray fibrinoid centers surrounded by red halos . Minor aphthous ulcers are < 1 cm and generally heal in 10–14 days. Major aphthous ulcers are > 1 cm and can be disabling due to the degree of associated oral pain. Image Source The above image is chosen and displayed from the web. This image do not belong to Gate To Medicine. The author is the responsible owner of the image. We believe that this image is helpful for your learning.